Wood Badge is a Scouting leadership programme and the related award for adult leaders in the programmes of Scout associations throughout the world. Wood Badge courses aim to make Scouters better leaders by teaching advanced leadership skills, and by creating a bond and commitment to the Scout movement. Courses generally have a combined classroom and practical outdoors-based phase followed by a Wood Badge ticket, also known as the project phase. By “working the ticket”, participants put their newly gained experience into practice to attain ticket goals aiding the Scouting movement. The first Wood Badge training was organized by Francis “Skipper” Gidney and lectured at by Robert Baden-Powell and others at Gilwell Park (United Kingdom) in September 1919. 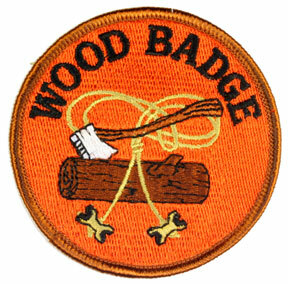 Wood Badge training has since spread across the world with international variations. On completion of the course, participants are awarded the Wood Badge beads to recognize significant achievement in leadership and direct service to young people. The pair of small wooden beads, one on each end of a leather thong (string), is worn around the neck as part of the Scout uniform.